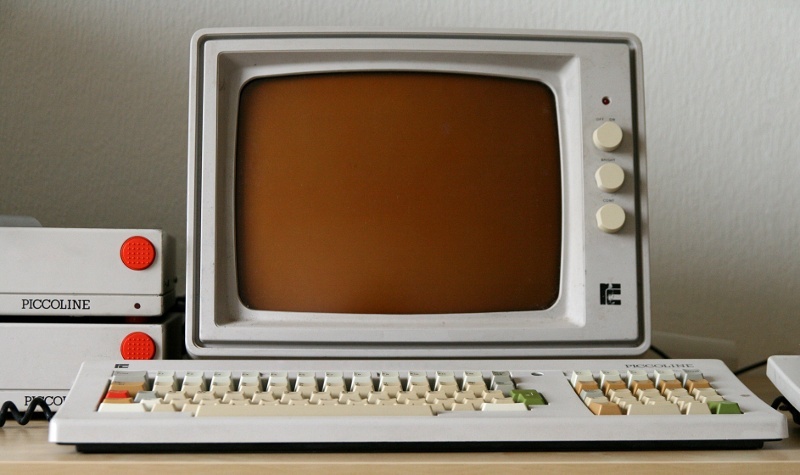 The RC759 PICCOLINE is a microcomputer which was marketed and assembled by Regnecentralen, Denmark, in the years 1984-1989. It is the successor to the similar PICCOLO computer. It was mainly directed at the Danish education system at the elementary school and high school levels. The computers were powered by an Intel 80186 Processor clocked at 6-8 MHz, and had memory in the range of 256 to 1024 kB. The most usual monitor was monochrome, but the computer also supports color monitors. The computers were usually hooked up to a common floppy disk station, from where the operating system, Concurrent CP/M 86, and files were loaded from 5 1/4" floppy disks - up to 4 computers shared a disk station with 2 floppy drives. The computers also had support for storage on audio casette tapes, and later it became popular to connect the computers in a LAN, with a RC PARTNER equipped with a 10, 20 or 40 MB hard drive acting as server. The PICCOLINE is quite different from IBM-based PCs of the same era. The floppies are read in a different way, and the file system is different. The purpose of this site is to collect all knowledge about the PICCOLINE. It has been an old dream of ours to execute PICCOLINE executables on a modern PC. This has come closer to reality, due to the joint effort with Hampa Hug, author of the PCE PC Emulator, to create a working emulator for the PICCOLINE system. This work is also covered on this site.